We’d love your help. Let us know what’s wrong with this preview of Remember Me by Stacey Nash. Anamae Gilbert managed to thwart The Collective and rescue her father, even though his mind is now a shell. Determined to stop Councilor Manvyke hurting her family again, she’s training to become an active resistance member and enjoying a growing romance. Bu An exciting new adventure from Stacey Nash, set in the world of The Collective. To ask other readers questions about Remember Me, please sign up. When Anamae woke in a strange room, with a person standing beside her she had never seen before plus a sensation of not connecting, she had no idea the horror of the next few weeks. As she came to realize that she had no memories of anything in her past, that the people around her seemed false and cruel, she knew something was terribly wrong. But the training she was doing felt right – she certainly knew what she was doing. What was going on? Who were these people and why did she feel like a prisoner, trapped? Why couldn’t she remember? This second novel in the YA fantasy series of The Collective by Aussie author Stacey Nash is excellent. Fast paced with a brilliant plot and some great twists. I thoroughly enjoyed book two, and can’t wait for the next in the series. Highly recommended. I really enjoyed Forget Me Not, the first book in The Collective series, but Stacey Nash has kicked things up a notch in Remember Me. Mae and Will have been training hard with the resistance. She is happy to have her father back – even with his memory gone – and her relationship with the gorgeous Jax is growing stronger by the day. But then the resistance is attacked and Mae wakes up in an unfamiliar location. She can’t remember who she is and is taken to a large house she is told is her home. She I really enjoyed Forget Me Not, the first book in The Collective series, but Stacey Nash has kicked things up a notch in Remember Me. But then the resistance is attacked and Mae wakes up in an unfamiliar location. She can’t remember who she is and is taken to a large house she is told is her home. She is told she is part of a secret organisation called The Collective and has been transferred to this new school because of her potential. But nothing seems familiar and nothing adds up. Even with her memory gone, Mae was strong, more so than in the previous installment. She questioned everything and even though she played along most of the time for her own safety, she didn’t let herself be pushed around. She is befriended by a girl named Cynnie, and I really enjoyed the friendship that developed between them. She really cared about Mae and was willing to risk getting in trouble to help Mae. I liked Will in the first book, but now I like him even more. After his concern for Mae I started liking the idea of Will and Mae as a possible couple and found myself a bit torn about who I wanted her to be with – especially after a certain scene between Mae and Will. Will was head strong and very determined and stopped at nothing to ensure Mae was rescued. Though I was swayed a little toward Will, I am very much still team Jax. Jax was just as gorgeous and swoonworthy as ever, and I love the chemistry between him and Mae. And then there was that ending! Where did that come from? The direction it went very much surprised me and has me nervous about what is going to happen in the next book. There was also a BIG reveal in this book that was very exciting and sets up book three perfectly. 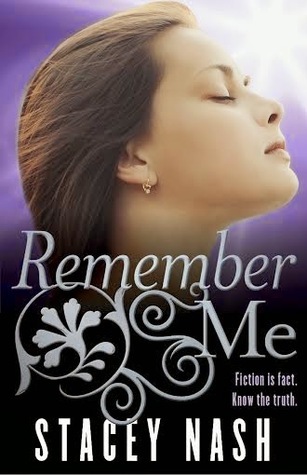 Stacey Nash creates another great book in the Collective Series, Book 2, Remember Me. Anamae Gilbert and friends are training to continue their fight against the Collective. Mae and Jax were captured by the Collective. Their memories were stolen, and they were programed into thinking they are part of the Collective. I really dislike the Collective. They are the epitome of evil. I love Mae’s character. She is strong and smart. The characters are well-developed and believable. Stacy Nash is an exceptional writer. Her work is extremely descriptive. Remember Me was well-written and full of surprises. There were times I could not believe what was happening. I would love to see this turned into a television series. I cannot wait for book three. Now, before I get too critical, I will point out that I have not read the first book in this series, and therefore may be missing some of the point. I found this on Netgalley, via Harper Collins and thought it sounded vaguely interested, and it was. Dystopic-style world, love triangle, the resistence VS the masses, it offered nothing new, but more of the familiar. However, the entire novel is pretty much pointless, as far as I can tell. The main character, Mae, loses her memory in about chapter Now, before I get too critical, I will point out that I have not read the first book in this series, and therefore may be missing some of the point. I found this on Netgalley, via Harper Collins and thought it sounded vaguely interested, and it was. Dystopic-style world, love triangle, the resistence VS the masses, it offered nothing new, but more of the familiar. However, the entire novel is pretty much pointless, as far as I can tell. The main character, Mae, loses her memory in about chapter three and finds herself in with the "Collective" (they're the bad guys, why, I'm not entirely sure having not read #1 but I'm assuming corporation, brainwashing, basically manipulating free will etc) and more-or-less believes herself one of them. There's a guy, or rather two guys, one who seems to want to be with her all the time but is a bit on the creepy side, and his brother - who is naggingly familiar. Slowly Mae starts to remember parts of her old life, with a sense of deja vu etc. On the other side, amongst the resistence, her friend Will (another corner of the love triangle and he plays the role of BBFF (Boy Best Friend Forever)), struggles to rescue her. And he does. And the end. So, why the annoyance? Because there is no character development - Mae spends much of the novel rather confused, but at the end returns to (presumerably) the same state she was in at the beginning. Does she learn deep, dark secrets about the Collective? No, although a few things are revealed, let's be fair (the sensors, (view spoiler)[her mother (hide spoiler)]) but overall, these are something that could be fed into a plot that actually advances the story further. And the characters were flat. I didn't really care much for any of them. I skimmed some of the passages because I felt no connection. Mae did dumb things. Nik did things she deemed as creepy. Joshua was just there and familiar. I guess I kinda liked Cynnie and possibly Will but... Yeh. This felt self-published, and not only that, but written by an inexperienced writer. It wasn't terrible by any means - there was a plot, some thought had clearly been put into the world creation, and the writing style was actually pretty good, but... it left me wondering - what was the purpose of this novel? You could, probably read book 1 then book 3 without losing anything. Not that I've read book 1, and I certainly won't read book 3. First off the cover is deceiving but I have to say this was a good deceiving because at the moment I can’t think of a single thing in this book that really irked me. During the first 50 pages we jump sides extremely quickly. Anamae (like anime) our heroine who goes by Mae is part of the resistance against the government. When she is captured by the enemy and has her mind erased she has to fight for her memories back and go back to the life she left behind. I read this book over a course of two d First off the cover is deceiving but I have to say this was a good deceiving because at the moment I can’t think of a single thing in this book that really irked me. During the first 50 pages we jump sides extremely quickly. Anamae (like anime) our heroine who goes by Mae is part of the resistance against the government. When she is captured by the enemy and has her mind erased she has to fight for her memories back and go back to the life she left behind. I read this book over a course of two days and could not under any circumstance get it out of my head. If you like Hunger Games, Divergent, or Legend you might very well like this book. The book shows you not everything is black and white there is gray to why the “bad” side is doing what they’re doing and not everyone under them is evil; that is a perspective that is hard to find these days in dystopian novels. For those of you who like romance there is some good cute romance in here with both her best friend/becoming more and her crush. For those of you who like action there is enough of that to satisfy the most picky person without it being too much or too little. What more can I say besides I loved the book *pets book*. What are you waiting for? GO READ THIS BOOK NOW :). Final Rating 4.5 out of 5 stars. Want to read more reviews by me? http://sweetendbook.blogspot.com/ Check it out. Now, I need to start with a disclaimer: Stacey Nash is a very good friend of mine. I adore her and her writing. So in the interests of fairness and an unbiased review, I'll follow up with this: I did see a handful of typoes throughout Remember Me. THERE, I SAID IT. Now let me move onto all the things I loved about this book! In a way I'm regretting giving Forget Me Not a five-star rating, because I feel like Remember Me deserves at least an extra half star. It's because the first book is the discovery story, whereas in this second book we get to peel back additional layers of this interesting world and see what's underneath. You'll see from reading the blurb that Anamae loses her memory and wakes up somewhere strange. I initially assumed she'd just forgotten all of her resistence friends (with amnesia they would be strange to her), so I was intrigued to discover she'd been taken by the Collective. This meant we got to see their world through a stranger's eyes -- in Forget Me Not they were a faceless, well, collective, but in Remember Me we see that it's not all black and white after all. There are factions and an interesting, Illuminati-style creation myth. The other thing we get in the sequel is a dual point of view, split between Anamae and her best friend, Will -- who is still with the resistence fighters. He goes a little crazy at the start of Remember Me after Anamae is taken. In the same way that she rushed into danger to try and save her dad in the first book, he doesn't exactly think through his actions in trying to save Mae. To give him credit, though, he does realise after a while that he's behaving rashly, and since he loves Mae I forgave him. My other favourite character in this book is Lilly, daughter of the resistance leader. I love how determined she was not to be over-protected by her father. I think when Mae breaks Will's heart (which I'm just assuming is going to happen because she's still all googly-eyed for Jax), Lilly would look after it and nurse it back to health. Review originally posted on Sharon's Book Nook! Remember Me was a fun ride and I was glued to this book needing to know what was going to happen next. I flew through it as a result. This was a fantastic read and we don’t have to get very ma Review originally posted on Sharon's Book Nook! This was a fantastic read and we don’t have to get very many pages into the book before the action starts. Here we thought that Anamae, Will and Jax were safe from the clutches of The Collective but that all changes right from the start. We then go on a journey and learn about lots of new ‘tech’ that is in the possession of Manvyke and his community and just how far they are willing to go to protect themselves and hide their secrets from the world. The characters are great. Anamae is strong and you can see how she’s changed since book 1. Even Will and Jax have matured, and the villain – Manvyke is just a ruthless as he has always been, maybe even worse as we get to know him better in this time. The love triangle is more prominent in this book due to the circumstances that Anamae was thrown into and her decision is a tough one for her to make. You really feel for her and can understand why she feels the way she does. Overall, fabulous read once again and I recommend this to you if you love tech gadgets, young love and a ruthless villain. I look forward to the next installment in this series. Remember Me is the second book in the Collective Series. In this book Mae and Jax are kidnapped by the collective. The collective wipe out their memories. They tell Mae she was injured in a training exercise and that is why she can't remember anything. With Jax they only wiped his memories from when he was with the resistance. The Collective have Mae go to school and training to learn the Collective ways. The whole time Mae feels as if something is off. She can't understand why she would not remember anything at all. She gets the feeling she does not belong there. After she meets Joshua ( who is Jax) she keeps getting a sense of deja vu. Then things start to happen that reinforce to her she is not suppose to be there and neither is Joshua. I enjoyed this book more than the first. Mae was not as irritating and running off without thinking first. Will was the one in this book who kept acting before thinking. In this book you got to see what goes on in the Collective community. You also see that not all Collective feel the same way about keeping the tech a secret. Some feel that the public have a right to know it is out there. In this book they also go more in depth about the Tarlequin and it's history. The characters were better written this time. They had more depth and were more interesting. The love triangle was more heart wrenching. You know someone will be hurt. After getting to know the characters better you feel bad about it. I didn't read book 1. I don't think it has any bearing on my review. Daddy is kidnapped and is no longer the same man he was. Mae has a thing with Jax and Will loves her. She is fighting for the rebellion. Now book 2, the beginning is good but it goes down hill from there. It does pick up towards the end, but I'm left with a feeling of 'too little too late'. I have no connection with the characters possib I didn't read book 1. I don't think it has any bearing on my review. Daddy is kidnapped and is no longer the same man he was. Mae has a thing with Jax and Will loves her. She is fighting for the rebellion. Now book 2, the beginning is good but it goes down hill from there. It does pick up towards the end, but I'm left with a feeling of 'too little too late'. I have no connection with the characters possibly due to not reading book 1. But hey Mae is a whole new person in this book due to amnesia, but I still don't connect with her. I read reviews on book 1 raving about tech. Yeah there is tech in this book but an author has power to think up great technologies without any scientific foundation. Pigs can fly in books. However I don't base a books worth on how great the authors technological imagination is. The book has to have substance. There needs to be a good story line with memorable characters who are funny, brave, smart, bold, wreckless, irresponsible and so on. The dialogue has to be engaging (not flat and boring just to fill up pages). Characters have to have chemistry, love, hate, power and depth or even be shallow as long as they have flare and sparks. Its an okay read when there is nothing left to read. It's not a page turner. Maybe my views would be different if I read book 1, if I got to know the other characters better. But as it is, 2.5/5 is the best I can give it. 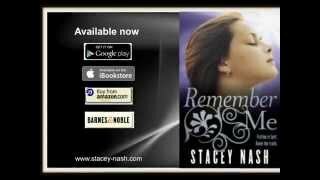 Remember Me is the second book in The Collective Series by Stacey Nash. Jax and Anamae are kidnapped by the Collective, who wipe their memories and then send them to school and pretend everything is perfectly fine; all the while trying to get information. It takes some time but things slowly start to come back to them, and the build up is so t 4.5 stars out of 5. Jax and Anamae are kidnapped by the Collective, who wipe their memories and then send them to school and pretend everything is perfectly fine; all the while trying to get information. It takes some time but things slowly start to come back to them, and the build up is so tense. I was begging them both to remember anything the longer it went on, out of fear they’d be stuck there forever. The book is split between the POV of Anamae and Will, her best friend who is frantically looking for her. Now. In the first novel there was a vague one sided love triangle. And it’s no longer one sided. It’s the ONE thing I didn’t like about this novel, though it did propel the plot forward. Remember Me is the second book in Nash's The Collective series; and I have to say, for me, this is the book where things get serious :) I was lucky enough to beta read part of this manuscript, and it's clear how straight away from the get go, things have changed. Forget Me Not was a strong introduction into a world where fiction is fact, and nothing is as we know it--Remember Me plunges us into a much darker place, where the characters who were sweet and optimistic in book one are forced to conf Remember Me is the second book in Nash's The Collective series; and I have to say, for me, this is the book where things get serious :) I was lucky enough to beta read part of this manuscript, and it's clear how straight away from the get go, things have changed. Forget Me Not was a strong introduction into a world where fiction is fact, and nothing is as we know it--Remember Me plunges us into a much darker place, where the characters who were sweet and optimistic in book one are forced to confront their darkest fears--and their deepest truths. Remember Me is the second book on the collective series and things get even more complicated with Mae no remembering and seeing everything with new eyes. Also we discover more about Manvyke what he is capable of doing to get what he wants, power. This second book grabs you right from the beginning with a great character development and grow. Every single one of them has changed from what they discovered in the first book, but we’re still pending lots of rides. This series masterfully written by S Remember Me is the second book on the collective series and things get even more complicated with Mae no remembering and seeing everything with new eyes. Also we discover more about Manvyke what he is capable of doing to get what he wants, power. This series masterfully written by Stacey Nash builds and builds the tension making you sit at the edge of your seat until you finish and you just want the next book right now. I know the series still have lots of things to discover and many adventures. Also, I can’t wait to read more of Jax. I tried, I really tried, but this is the second book and I don't care what happens to any of the characters. I don't care about the story or the world building or anything. I forced my way through fourteen chapters, and then read the last one just to see how it ended (predictably). I don't know, maybe it just wasn't for me? I don't think that I can write a fair review because I don't see where I lost complete interest. Stacey Nash...you have done it again. Just when I thought The Collective series couldn't get any better, it did! This book ramps up from where we left off in book 1 and the action never stops. I felt so sorry for Will as he realizes his feelings but I am Team Jax all the way! The twists and turns with this second installment leaves you wanting so much more and many unanswered questions. I cannot wait for book 3! Young adult is not just for the young people! Read this! Remember me starts off slow, but just before the half way mark, things got really exciting and i was hooked! I just love love triangles, and at one point there were 3 guys vying for Mae's attention. This series as just as exciting and addictive as all my favourite YA series. I cannot wait for book 3! Remember Me: I normally would not read a series unless all books are published. The main reason is the cliff-hangers at the end. I have been known to throw a print across the room over this or hand my kindle to my husband and walk outside and kick a tree over digital. For me the worse part of a book is reaching the ending cliff-hanger. It is similar to walking to the edge of a 2000 foot cliff and you are still not able to see the end of the rainbow. Yes, I am glad I was able to start this second book as soon as I finished the first. My poor 100+ year old tree is tired of me kicking the base. I do not feel the author provided all the answers to my questions so I am wondering if there is a third book coming to this series. Will questions be answered? What happens to the collective? Will Anamae be able to rescue her mother? I have so many questions swirling in my head about this series. I do recommend this to any who enjoy the young adult fantasy. Remember Me is the second instalment in a series and continues from where the first book Forget Me Not ended. I would not recommend reading this second part if you haven't read the first one before. You would be missing too much information to make much sense of the plot. I really enjoyed the characters in Forget Me Not and loved how Stacey has developed them further in this second part. Although I read Forget Me Not over a year ago, I had no difficulties being completely absorbed into the plot o Remember Me is the second instalment in a series and continues from where the first book Forget Me Not ended. I would not recommend reading this second part if you haven't read the first one before. You would be missing too much information to make much sense of the plot. I really enjoyed the characters in Forget Me Not and loved how Stacey has developed them further in this second part. Although I read Forget Me Not over a year ago, I had no difficulties being completely absorbed into the plot of Remember Me straight away. Next to a fantastic action-packed storyline, the author created an intoxicating atmosphere that had me holding my breath on several occasions. I started caring for the characters so much that I was afraid to turn the next page in case something bad would happen to them. I also really loved the dual perspective of this book, as the chapters were either told from Mae's or from Will's point of view. I thought that the Collective Community was brilliantly described and I had a pretty clear idea of what the houses, people etc. looked like. I had the pleasure to read this for Stacey as a CP. Remember Me is a fantastic continuation of Mae's story. We see The Collective in more detail, learn parts of their history and politics, and through Mae's eyes we see the plot thicken. We also get to know some unexpected characters. You also get to see through Will's eyes as he continues the fight against the Collective. I loved this added perspective as Will has such a big heart and burns with conviction. Not only does the plot thicken in this c I had the pleasure to read this for Stacey as a CP. Remember Me is a fantastic continuation of Mae's story. We see The Collective in more detail, learn parts of their history and politics, and through Mae's eyes we see the plot thicken. We also get to know some unexpected characters. Not only does the plot thicken in this continuation of the series, but the love triangle intensifies too. First things first for all of you wanting you to read this book. You would need to read the first book first otherwise you’d be like me completely confused as to what’s going on. The book itself was well written, the characters were loveable and I still pushed to finish the book even though I was quite confused. I loved it and can’t wait to see more from this author. Loving this author's writing. The book held me captivated with the main character having lost her memory. It was brilliant work. The tension between the characters is awesome with Mae struggling with her feelings between the two boys out for her affection. Great world created and awesome characters. The series continues with this being the 2nd book. And again, Stacey Nash doesn't disappoint! The story plot is amazing! Not a plot you would think once you are looking at the cover of the book of this series! Characters are amazing! Can't wait to start the next one! An engrossing sci-fi adventure that leaves you wanting more. I am excited about this series and can't wait to read more in the series and by the author. I was given this book in exchange for an honest review by Netgalley! Good book- but be sure to read the first one before taking a gander at this one! It can stand alone but the first one helps build the world a little more. I beta read Remember Me and I just love the twists that Stacey Nash brought to this book. It's a great sequel. Writing for the young and new adult market, Stacey's books are all adventure filled stories with a good dose of danger, a smattering of romance, and plenty of kissing! Her debut novel, Forget Me Not was released as a three book series through HarperCollins Australia during 2014 / 2015. And her Oxley College Saga is out now. Hailing from the Hunter Valley in New South Wales, she loves nothing more Writing for the young and new adult market, Stacey's books are all adventure filled stories with a good dose of danger, a smattering of romance, and plenty of kissing! Her debut novel, Forget Me Not was released as a three book series through HarperCollins Australia during 2014 / 2015. And her Oxley College Saga is out now.